Oregon Jams come in a variety of flavors and colors. Debra Harris pours huckleberries into a canning jar. KENO, Ore. — A hobby has turned into a business for Debra and Roy Harris. After decades of various jobs — Ray was a logger, Debra has long been involved in multiple phases of the food industry and both were mushroom pickers and buyers — the Harrises planned to retire. But because their experiments with making jams from fresh fruit literally jelled, they’re putting in even longer hours than before. “I know it’s odd for people as old as us to jump into something new,” she laughs. Debra is 65, and Roy just turned 67. 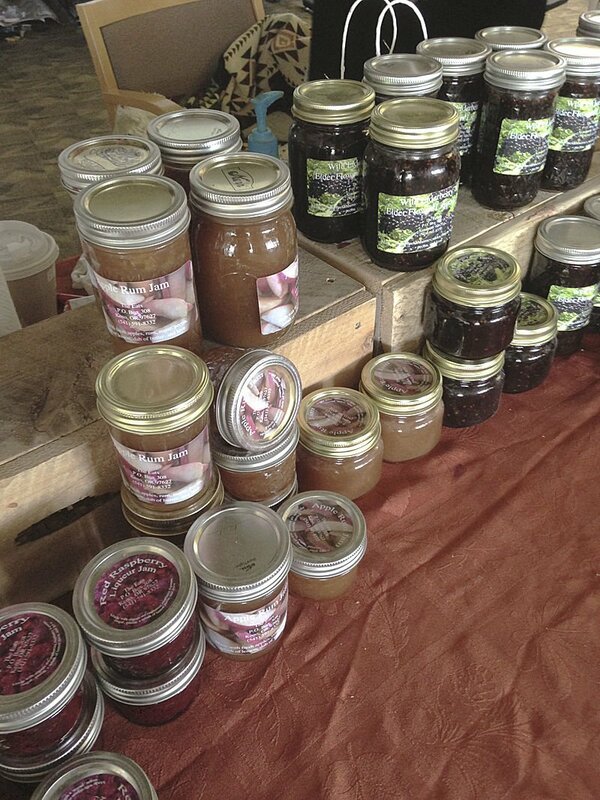 Their business, Oregon Jams: Specialty & Wild Barry Jams, began last summer when they began selling jars at farmers’ markets. Their offerings sold quickly. Forty-five jars of huckleberry jam sold out in two hours at a Bend farmers’ market. Week after week the pattern repeated itself. At the advice of their daughter, they raised their prices, eventually tripling the original price. The Harrises pick some fruit — including elderberries, apples and peaches — from their shared orchard in Keno, a small southern Oregon community near Klamath Falls. Their multi-varieties of jams are making buyers real happy. Some varieties, like raspberry and huckleberry, are straightforward and take only a few hours to make. Others are more involved, specialties like marionberry-raspberry liqueur and peach amaretto. Because they’re supposedly retired, the Harrises are trying not to spread themselves too thin. The couple is always testing new recipes and varieties. This spring they have plans to add more specialties jams, including dandelion, fir and spruce trip (“very fruity and very good for you), manzanita flower and wild rosehip. 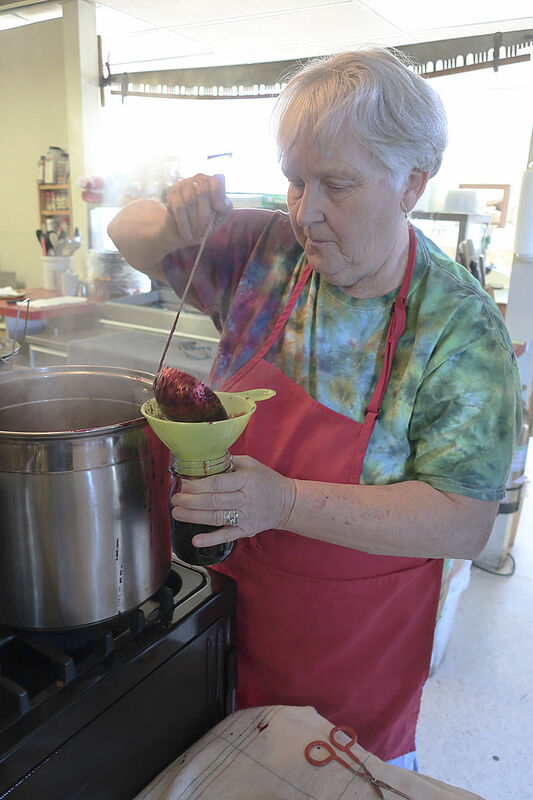 “We’ve always dealt in wild food,” Debra says, noting Roy is a game hunter, she’s made herbal medicines and canned for decades, and for about 40 years they were wild mushroom pickers and buyers. Now the Harrises are focusing on their wild berry and specialty jams, a business that’s mushrooming so rapidly they’re moving from their home to the kitchen at the Keno Grill restaurant. In upcoming weeks they’ll spend three or four days a week cooking jam, making 45 to 60 dozen jars for farmers’ markets. Flavors: Peach, amaretto, pear rum, apple rum, marionberry, raspberry liqueur, elderberry/huckleberry, raspberry in raspberry liqueur, huckleberry jams and this spring will add dandelion, fir and spruce tip, manzanita flower and rosehip jams. Prices: 4 ounce jars are $6; 8 ounces are $10, 12 ounces are $15 and pints are $20. The winter tonics are available only in quarts for $50. For information: Send emails to oregonjams1@gmail.com or call 541-591-8332.